According to the World Economic Forum June 2015 stats, the U.S. Department of Defense is the largest employer in the world with 3.2 million on the payroll. It is not surprising to learn that over 60% of those brave women and men are married. That’s approximately 1.9 million military love stories looking for happily ever after. Where does a military love story really begin? Is it at birth or at first sight? In the case of British comedian John Oliver and U.S. Army combat medic Kate Norley, their Military Love Story begins in September, of 2008, in Saint Paul, Minnesota at the National Republican Convention. As the eldest of four children, growing up in Bedford, England Oliver dreamed of playing soccer professionally for Liverpool when he was young. While attending Cambridge University, he answered his comedic calling and joined the famed Cambridge Footlights comedy troupe. He continued to write and perform stand-up throughout England after college. Then in 2006, he got the big call from Jon Stewart, with an invitation to come to America and join the Daily Show. Oliver accepted and arrived in New York the day before his first appearance as Senior British Correspondent. Raised in Virginia, Kate Norley’s parents always encouraged her to cut her own path. At the age of 16, while riding her bike to a soccer game, she was hit by an out of control driver. She experienced severe head trauma, losing all her cognitive skills. Requiring her to learn to read and write again. It is no surprise that following the terror attacks on 9/11 Norley stepped up to serve her country and at 19, enlisted in the U.S. Army. Her role in the Gulf War was counseling soldiers experiencing war-induced mental trauma and working with squatters living around Camp Blackjack, the 1st Cavalry Division’s base in northwestern Baghdad. And then went on to Fort Hood, Texas- based 1st Cavalry Division’s 15th Forward Support Battalion as a mental health specialist. 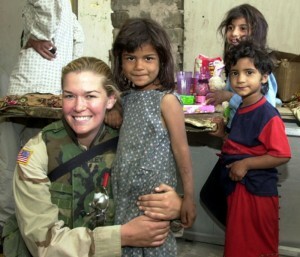 By 2008 Norley, had completed her time in service and dedicated herself to advocating veterans-rights. She was attending the Republican National Convention with fellow veterans when she met Oliver. On location at the Republican Convention broadcasting for the Daily Show, Oliver found himself being pursued by security for entering into restricted area. Still on temporary work visa, Oliver was running the risk of being deported if arrested. As he and his camera crew were seeking a place to hide, they met a group of veterans who offered to help. Among the group was U.S. Army combat medic, Kate Norley. Emails were exchanged. And three years later they were married. John Oliver understands the sacrifices that go along with being a military spouse and looks for every opportunity to stand beside and support his wife Iraq war Army veteran Kate Norley. At the end of 2013, after eight years Oliver decided it was time to leave the Daily Show. The next day he and Kate left for Afghanistan as part of the USO Tour. They slept in the barracks, ate with the troops and performed at more than half a dozen forward operating bases. Here’s your chance to combine your flair for writing and your military life experiences for a chance to be featured in our Military Community. The theme is Military Love Stories. We are looking for well-written, creative, meaningful real-life stories that celebrate the heartwarming power of LOVE in Military Life. 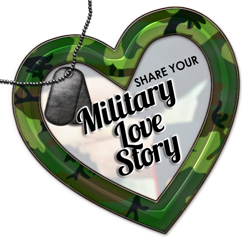 Share your Military Love Story for a chance to be featured in our Community Blog and newsletter. We are looking for well-written, creative, meaningful stories that celebrate Military Love.